The legendary Little Missy Eviscerella Dress, a proud Moonmaiden Gothic Clothing exclusive as always! :D<br> <br> This sleeveless dress has a low, plunging neckline and a low back neck with crossover straps; and a beautiful panelled bodice. 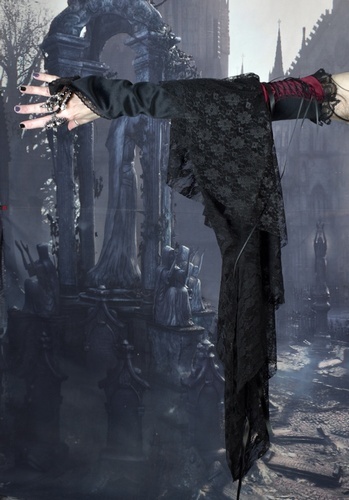 The skirt is fitted down to the knees, with a dramatic fishtail that flares out into a long train at the back, which you can pick up and work it when you’re on the move!<br> <br> Shown in some of the pics with the matching Eviscerella Glove, and the Bavmorda Bolero! This sleeveless dress has a low, plunging neckline and a low back neck with crossover straps; and a beautiful panelled bodice. The skirt is fitted down to the knees, with a dramatic fishtail that flares out into a long train at the back, which you can pick up and work it when you’re on the move! Shown in some of the pics with the matching Eviscerella Glove, and the Bavmorda Bolero!